Netters Book — Stephanie Marango, M.D. Students and practitioners in the health sciences face a universal paradox: while preparing to be a caregiver to others, it’s easy to lose sight of one’s own health and well-being. 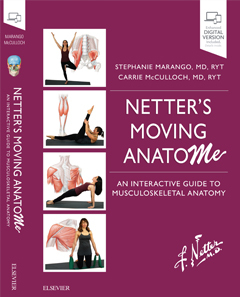 Netter's Moving AnatoME: An Interactive Guide to Musculoskeletal Anatomy is a textbook that helps you meet and overcome this challenge in a highly personal, uniquely effective way. This movement-based (Yoga & Pilates), interactive resource encourages you to approach anatomy by moving while you learn, with expert guidance from online videos designed exclusively for students of anatomy. In other words: you study anatomy as it relates to your own moving body. Both fun and functional, this experiential learning approach jump starts your personal commitment to self-care, wellness, and work-life balance by integrating academic material with real-life application.